People often wonder; if there is so much content on the internet, why do others still buy newspapers? Well, it all lies in the important reason why people buy or subscribe to a newspaper. The Internet is currently a part of everyone’s life. Its subscription has penetrated even the rural areas all thanks to the availability of smartphones and stable connection. The platform offers a ton of services and news isn’t the only thing. There are job advertisements and listings, government tenders, entertainment news, shopping guides, food, and pretty much almost anything you can think of. So, if there is so much the Internet has to offer, why would anyone want a newspaper? For one, the Internet may be important to some people, but it is filled with fake news, which, apparently, is perpetuated by social media platforms. News on the Internet tend to be short, sometimes irrelevant, misguiding, and it leaves one wondering what happens next. Newspapers, on the other hand, lets you avoid the common mistakes and leaves you better informed. This is where the Daily Nation newspaper comes in. Daily Nation has set the bar regarding the types of news one gets, the relevant information passed, and it sometimes makes you want to switch off your smartphone’s news notification. For almost six decades now, Daily Nation has continued to serve Kenyans across the country with innumerable circulations made every single day. 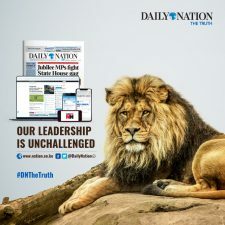 Daily Nation has a readership of more than 200,000 copies and it reaches more than 35 million readers in a month making it one of the leading newspapers in East Africa. Characterized by veracity and accuracy in reporting, the newspaper has cemented its presence across the country regarding the facts they publish, the stories, and the fairness it brings. The newspaper publishes news, opinions, sports, lifestyle, business, entertainment, markets, health, and travel to name a few. But how has the Daily Nation invested the truth that has brought all these people together? No true newspaper can survive without integrity and solid ethical values. It allows for objectivity, honesty, and fairness. These values guide a newspaper in all aspects of reporting be it local news, elections, commodity prices, inflation among others. Online media platforms harbor fake news based on hearsay, unverifiable anonymous tips, and innuendos. But the high subscriptions and the reach of the Daily Nation newspaper means the people believe and value it as a true channel of factual stories. The most touching and truthful of news and stories stem from journalists who dig deep and ask tough questions. Through their courage and boldness, they bring the truth by putting their emotions aside to unearth trustworthy events, people’s accounts, and places. Phone calls and unconfirmed sources do not suffice and they usually travel to the scene of events for live updates and show exactly how something is happening. This is one other quality that has attracted readership to the newspaper over the years. Among the many characteristics the Daily Nation employs are investigative skills with journalistic stories written by analytical minds. When there is more to a story, for the reader to grasp the whole idea, the concept is broken down to bits of information everyone can relate to. Coupled with expert communication skills and easy language, comprehension is conspicuously guaranteed. Nevertheless, critical thinking is mandatory for checking the credibility of the stories or data to avoid misleading the citizens. Media houses, to avoid being phased out of business and to fight the spread of fake news have blended online newspapers apart from the distributed hard copies. Daily Nation is a good example. The Daily Nation ePaper is available for subscriptions and is highly convenient for those looking to read the actual newspaper on their devices. What this means is that maximizing the use of technology is a leverage for newspapers to reach even a wider audience through variety, flexibility, and convenience.